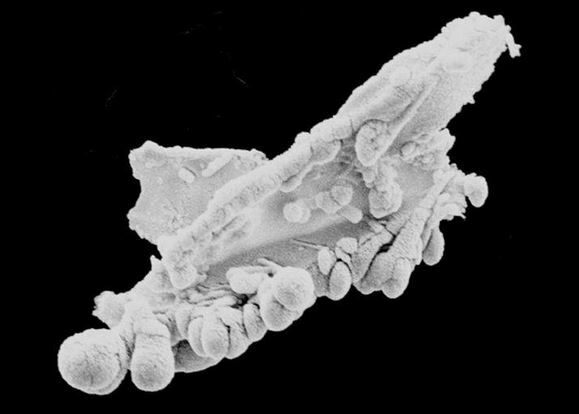 A team of researchers from the University of Sheffield and the Center for Astrobiology at the University of Buckingham, UK, unveiled an incredible photograph of a mysterious organism, tested and analysed and proven to be the first unequivocal evidence of the existence of extraterrestrial life. The alien organism, which does not exceed 10 micrometers has been called “The Dragon Particle” and is a “biological entity” composed of carbon and oxygen, essential elements of life. Researchers were able to get hold of the organism by sending a balloon to the stratosphere, located twenty-seven kilometers above Earth’s atmosphere. The balloons mission was to collect space particles during a meteor shower. Researhcers believe this discovery proves that mankind did not originate on Earth, but elsewhere in the cosmos. While other researchers have been very skeptical about the discovery suggesting that the “Alien organism” might have in face originated on Earth, Experts from the university of Sheffield and Buckingham have ruled out this possibility firmly suggesting that the “Dragon Particle” did not originate from Earth and came from elsewhere in the cosmos. Milton Wainwright, one of those responsible for the research, said this discovery not only proves the existence of life forms beyond Earth, but also often alien bodies raining down on our planet. “It is certainly unusual and seems to be like nothing found on Earth. “What is amazing is that these organisms appear on the sampling stubs in an absolutely pristine condition. “There is no pollen, grass or pollution particles found with them, or for that matter soil or volcanic dust. The discovery of Professor Wainwright and his team seems to be backed up by more recent discoveries from the Rosetta Spacecraft which is analyzing Comet 67/P Churyumov-Gerasimenko. Not long ago, Scientists in charge of the Rosetta mission have reported they have found OXYGEN in the atmosphere of comet 67/P Churyumov-Gerasimenko and are calling it one of the most incredible discoveries so far. This finding questions all previous models of solar system formation and can affect the way we search for life elsewhere in the universe. “The first time we saw it, we all went a little bit into denial because molecular oxygen was really not expected to be found on a comet,” said Kathrin Altwegg of the University of Bern in Switzerland, the project leader for ROSINA, the Rosetta Orbiter Spectrometer for Ion and Neutral Analysis. Interestingly, not only do researchers now know Comet 67P has oxygen, but experts also believe that the comet might be carrying life on it. According to leading astronomers, some of the mysterious features of the 67P/Churyumov-Gerasimenko comet can be tagged as Aliens. Researchers point towards the organic-rich black crust and that there might be living organisms beneath an icy surface. Mysteriously, the Rosetta spacecraft which is orbiting this strange comet has picked up abnormal clusters of organic material which according to scientists, resemble viral particles.